An 18th birthday is special. It marks the beginning of adulthood and often a year of significant events such as high school graduation, attending college, moving out of your parent's home and working full time. Even though you have probably outgrown most birthday themes that you once had as a child, there are still some ways to make your 18th birthday party, even in the dead of winter, special and fun as it should be. Grab a couple friends and some sleds, pieces of linoleum, tire tubes, trash can lids or anything else good for sledding. Then, head out to a snowy hill that is free from obstacles such as trees and doesn't bottom out at a road. Back home, warm up with hot chocolate and a birthday cake. Tell guests to bring extra dry clothes to change into. Call ahead to a restaurant and have your party there. If desired, some restaurants have separate party rooms. You can choose a casual restaurant or use your 18th birthday as a reason to dress up and dine in a finer restaurant. Allow guests to choose items off the regular restaurant menu or arrange with the restaurant ahead of time to provide a special menu for your party that fits within your budget. Call your local fire department and check to see if you can have a bonfire in your backyard. You may have to get a permit from them or a local government office. Roast hot dogs and marshmallows to make s'mores. Set up camp chairs around the fire to enjoy an evening outdoors near the warmth of the fire. 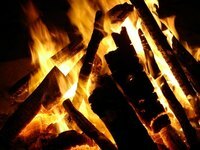 Always follow bonfire rules, as stated on the permit or stated from you fire department. For example some rules state you must have a fire extinguisher on hand, only burn during dark time hours and the fire must be at least 50 feet from any structure. Go out to a place that has karaoke or bring karaoke to your home. Some gaming systems have a karaoke game and microphone accessory. There are also karaoke machines you can buy or rent at a party store. Provide and also have guests bring photos of you and them together anytime from the past 18 years. Take the pages out of a scrapbook and provide the materials for everyone to make you a page that includes a special note. Even if a guest doesn’t have pictures of you and her together, she can still create a page using pictures of just you. Put the pages back into the book for you to keep.